What is the difference between a pool safety net and a pool safety fence? We’ll explain the pros and cons of both along with giving you a pricing estimate. Created by Katchakid in 1972, the Katchakid® swimming pool safety net is specifically designed as a barrier to help protect children from exposed, open water. Similar to an oversized tennis racket, the winter-safe UV stabilized pool net is stretched over the pool and anchored to deck-flush mounted fasteners. The netted cover is fabricated from the highest quality, most rigorously tested materials available – versatile and adaptable, the Katchakid® can accommodate most water features and is installed to meet strict ASTM safety codes. Available in custom colors to capture and enhance the ambiance and design of your pool, the Katchakid® pool safety net cover affords maximum security with total peace of mind. Exemplary Safety Record – 40yrs, 100% Drowning Prevention. Complete Peace of Mind – Danger is Covered. High Aesthetic’s – Maximizes Yard Space While Maintaining Clear View Of the Water. Ambient Colors To Compliment Backyard. Optional Leaf Cover – To Combat Seasonal Debris. Versatile – Can Accommodate Nearly All Water Features. ASTM F1346-91 – Meets Building Code Where This Standard is Designated. Manual Pool Cover – Typically Takes 8 Minutes To Replace, 5 Minutes to Remove. Attractive and durable, Katchakid’s transparent removable mesh pool fence adds a vertical layer of protection around your pool. A Katchakid fence provides quick and easy access to your swimming pool. The Textilene® mesh panels are resistant to mildew, abrasion, and sunlight so they will not rip, shrink or fade, and kids can’t poke through them. Our technicians are trained to install the concentric tension-based fencing system’s 15-ft sections in a configuration that works for you – either free standing or incorporating existing structures, such as exterior walls. Our fencing system may also include self-latching, self-closing, key-lockable gates. As a rule a pool safety net will be 3/4 of the cost of an isolation fence (A fence that encircles the pool entirely). A pool safety net for a typical pool will range from $1500.00 – $2200.00, these prices including all parts, tax and installation. 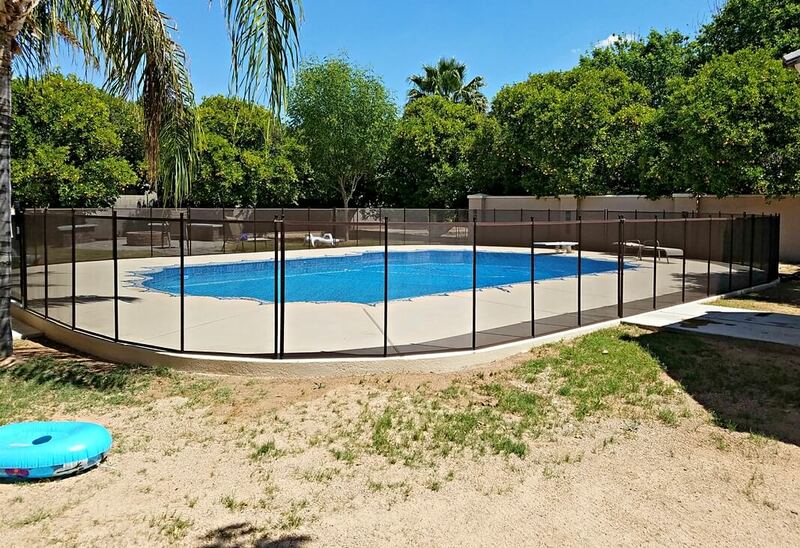 Pool fencing pricing is complicated due to the numerous configurations and possible color & height options -read here for a more detailed explanation and breakdown of the cost of installing a pool fence. 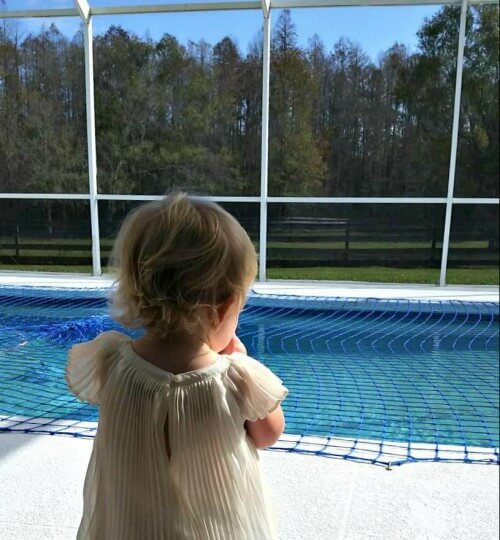 Again, the pool barrier you choose must be the one you are going to use, and water safety experts all agree that the best approach to keeping children safe around swimming pools is the full and competent supervision of an adult and multiple layers of protection. So whether you decide upon a pool fence to surround your pool or a pool net to cover your pool or both, make sure at all times your barrier is in good repair with covers securely replaced and pool gates shut and key-locked after every swim. 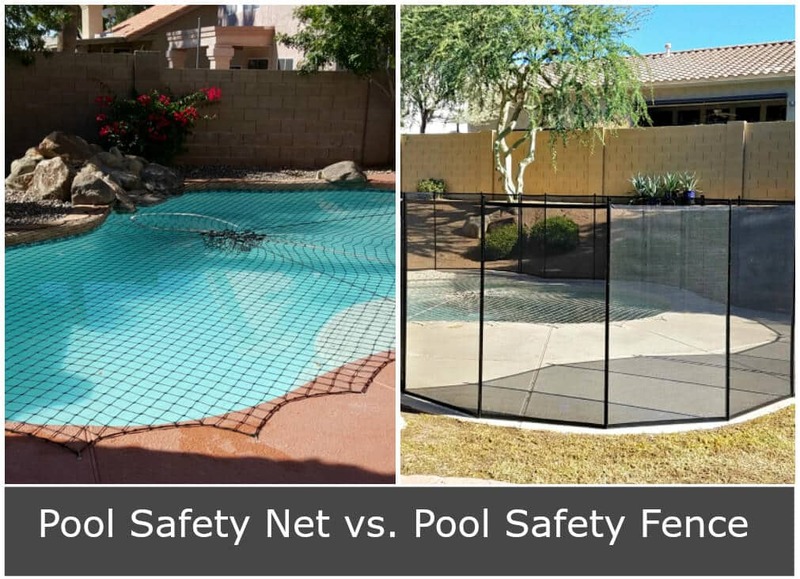 pool fencepool fence v pool netPool Netpool net vs. pool fencepool safety fencepool safety fence vs. pool safety netPool Safety Netpool-net-v-pool-fencewhich pool barrier is right for you?which pool barrier should I choose?